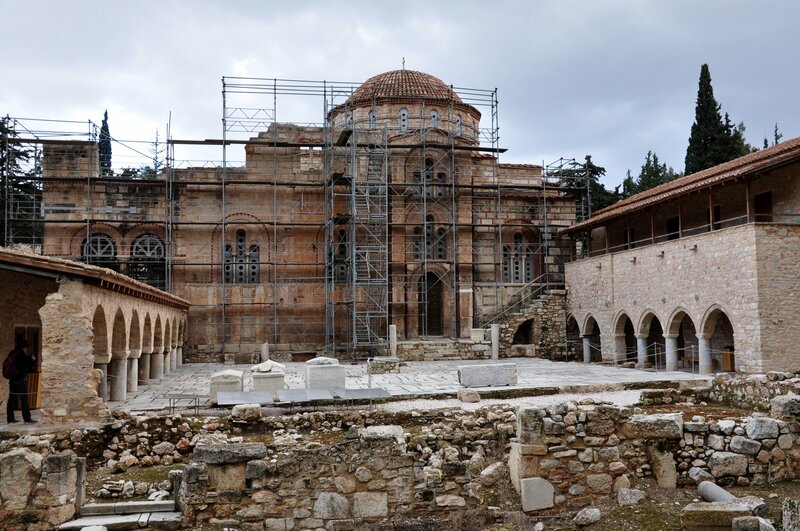 An extensive restoration project is well underway in the monastery of Daphni. In the 11th century, the Daphni monastery was fortified with strong external walls, resembling a fortress. 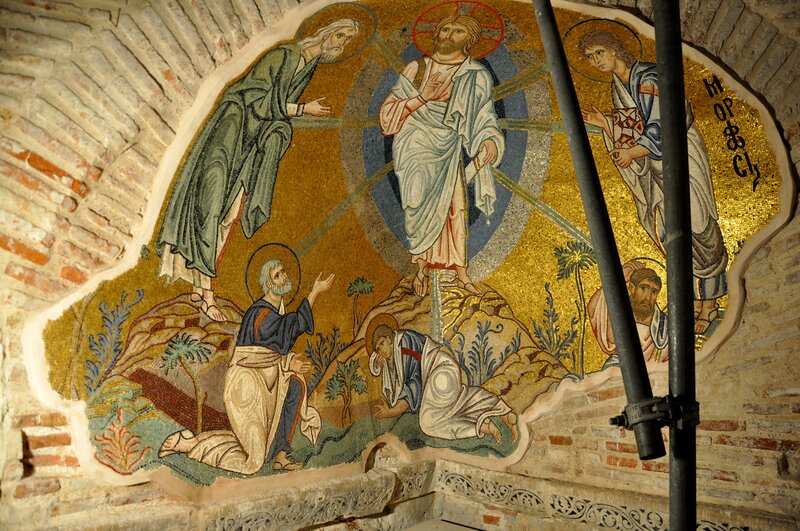 Mosaics in Daphni Monastery: the Resurrection. 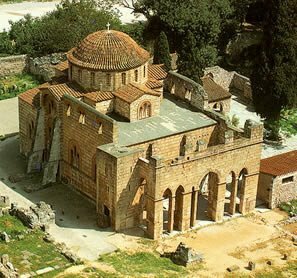 The 11th century Monastery of Daphni, along with the Monastery of Hossios Luckas and Nea Moni are outstanding examples of a type of construction characteristic of the middle period of Byzantine religious architecture, representing its most significant preserved monuments today. Although geographically distant from each other, these three monasteries (the first is in Attica, near Athens, the second in Phocida near Delphi, and the third on the island of Chios in the North Aegean Sea, near Asia Minor) belong to the same typological series and share the same aesthetic characteristics. The churches are built on a cross-in-square plan with a large dome supported by squinches defining an octagonal space. In the 11th and 12th centuries they were decorated with superb marble works as well as mosaics on a gold background, all characteristic of the 'second golden age of Byzantine art'. Nea Moni illustrates the simplest expression, an octagonal church with no added spaces. Hossios Luckas and Daphni are more complex: they have a central octagonal space surrounded by a series of bays that form a square. This more elaborate structure defines a hierarchy of volumes and functions and permits the implementation of an extensive iconographic and decorative plan. 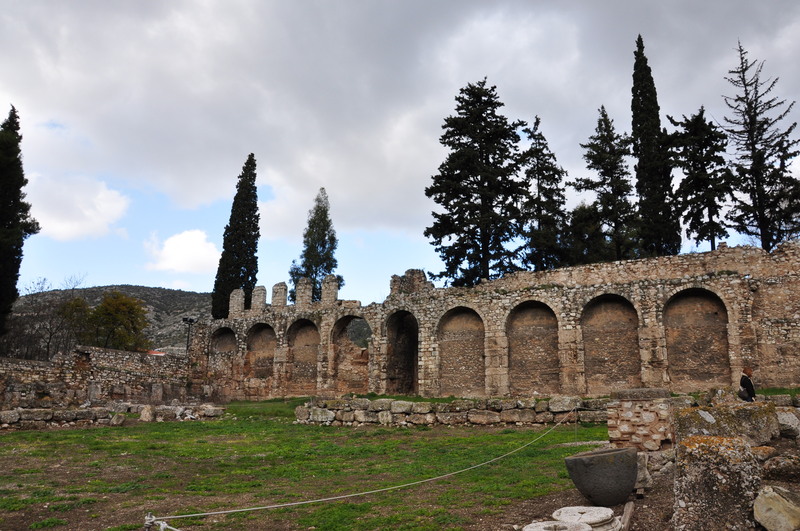 The Monastery of Daphni, located on the ancient sacred road from Athens to Eleusis, replaced a temple dedicated to Apollo Daphneios, which had been destroyed in AD 396. In the 5th century a basilica was built adjoining a wall that had been restored and completed under the reign of Justinian (527-65). It formed a square enceinte, 97 m on a side; a large part of the north wall, originally 8 m high, survives. This first monastery, discovered through a series of archaeological remains, was abandoned during the Slav invasions in the 7th and 8th centuries. It was not until 1100, when the Byzantine Empire was at its apogee under Alexis I Comnenus, that it rose out of its ruins. The church was built at that time. It had a narthex, to which a two-storey exonarthex was added a short time later. Other monastic buildings such as the refectory, cells and a well were built during the same building campaign and the church was sumptuously decorated with mosaics. In 1205 the monastery was sacked by Frankish crusaders. In 1207 the Duke of Athens, Otho de la Roche, gave it to the Cistercians of the Abbey of Bellevaux. They built a cloister and remodelled the exonarthex and the enceinte wall but without altering the mosaics. Daphni was returned to Orthodox monks after Athens was taken by the Ottoman sultan Mehmet II in 1458. Deconsecrated in 1821, the monastery has been undergoing restoration work since 1888.